BediuzzamanSaid Nursi (1877-1960), the Turkish mystic, can be considered as the spiritual founder of modern Turkey. At a time when scorn for tradition and faith was considered as the founding principle of Turkish nationalism in the country’s embrace of authoritarian modernity and secularism under Ataturk, Nursi revived faith in the tradition by leadinng people to the Qura’nic wisdom, despite simultaneously emphasizing the scientific and modern spirit that Ataturk wanted to instill in the people. He healed restless minds and focused on simple, yet noble virtues of simplicity, almsgiving, love of nature and animals etc. His Qur’anic notes, titled Risal-e-nur are collections of simple wisdom. Yet they became the cornerstone of the non-violent revolution of the Turkish society. Mehmet Tanrisever’s Hür Adam: Bediüzzaman Said Nursi is a biopic on Nursi’s eventful life and on the spiritual revolution he undertook. 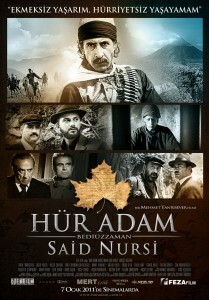 Hur Adam (Free man) is Mehmet Tanrısever’s third movie after Minyeli Abullah and Sürgün (Exile). He made the film after 20 years’ break, during which he did immense research on the project. Hur Adam was filmed in the span of eight weeks and it took 14 weeks to complete the production work. As many as 2,500 props were used in the film. Books on and by Nursi were the source the sources for the director to do research on the film. 163 minutes along, the film narrates the story of the scholar’s 80-year life. Acclaimed actor Mursid AgaBag played Nursi in this fm. He had been recommended to the producers and they did a test shot and liked it. To present the real spiritual life of Nursi Mursid learned more about the scholar’s history. He went on a serious diet for the film: loosing 18 kilograms during the filming in order to look like Nursi who ate only a little ans was thin in physique. Even though there was only a very limited visual material on Nursi, he tried to essay the role as far as he could. He considers it is his fortune to do the scholar. The shots of the film were admirable on account of their breadth; various kinds of camera techniques (wide, middle, close up, tilt up, panning etc.) helped to justify the length and nature of the cinema. One can say that, to some extent, there was overdramatization to give effect and punch required.